Sherwood Sugden and Company, 1988. Dr. Kirk does not condemn all professors, by any means. Among them he has found “a good many scholars of liberal minds and loyal hearts.” But he has scathing words for those “who feel they have been invested with the prophetic afflatus; and, having discarded theology and morals as so much antiquated rubbish, they are thrown back upon the dreary resources of twentieth-century nihilism.” He dedicates the new edition to the memory of Warren Fleischauer, who was his friend, a frequent reviewer for this quarterly, and a notable scholar and teacher. Kirk dedicated a fine study of Edmund Burke (1967) to John Abbot Clark (1903–1965) who taught English for many years at Michigan State University, and probably introduced Kirk, as he did this reviewer, to the writings of Irving Babbitt and Paul Elmer More. 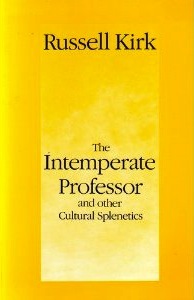 A shy, modest, learned man, Professor Clark never mistook in Stephen Leacock’s words, “the shadow for the substance or the casket for the gem.” In other books, Russell Kirk has praised such outstanding teachers as Richard Weaver, Gordon Keith Chalmers, Donald Davidson, and Frederick Wilhelmsen. Ambrose Bierce’s Civil War, edited by William McCann, recently reappeared under the imprint of Gateway Editions (Regnery Gateway, Inc.).